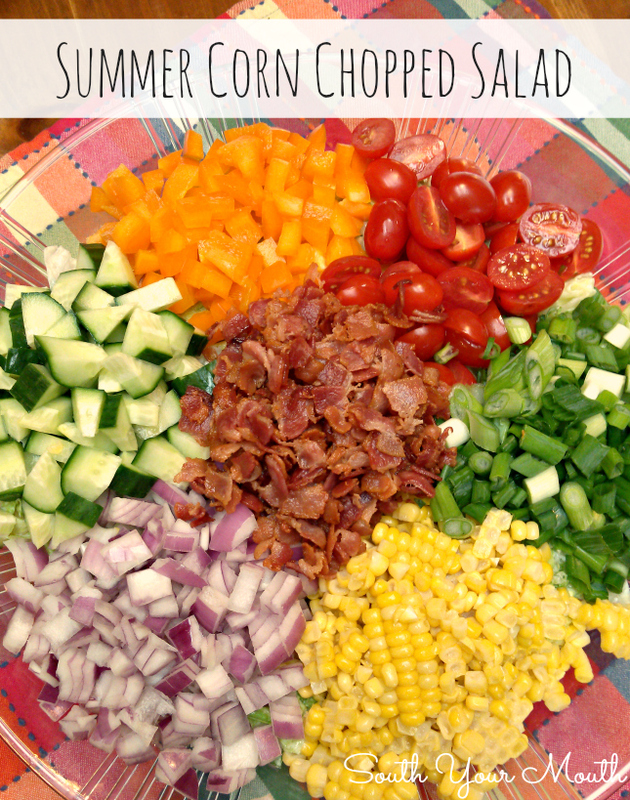 Easy chopped salad recipe with fresh corn, bacon and crisp veggies. There are four very amazeballs things about this salad. #1 - I love adding fresh corn to salsa, quesadillas, salads and ice cream! Just kidding about that last one. Just wanted to see if you were paying attention. And you don’t have to use frozen or, God forbid, canned corn. All you have to do is toss it in the microwave for a few minutes! Boom. Done. AND the husks peel away taking the silk with it. Holla! # 2 - When you serve a salad like this, the greens are under all the chopped vegetables so when folks serve themselves, they just scoop out what they want with a pair of tongs and leave the things they don’t. If someone doesn't like onions, they just steer clear of the mound of onions and so on and so forth. # 3 – Um, yeah. Look at it. # 4 – I usually make this with dried cranberries but I didn't have any on-hand when I made this (I’m going to include them in the ingredients because they're SO GOOD with this salad). And I also LOVE chopped boiled eggs or walnuts with this. I’ll list some more ideas below. Place both ears of corn in microwave and heat on high for 3 minutes. Remove from microwave and cut the stalk end off of each ear. Peel the husk and silks away. Slice kernels off each ear; set aside to cool. Arrange romaine in the bottom of a large, shallow serving bowl. Top romaine with piles of remaining vegetables, cranberries and bacon. Cover and refrigerate until ready to serve. To serve, provide tongs and 2-3 dressings for variety. I like to serve green goddess, ranch and a vinaigrette. Almost too pretty to eat! I like your idea to add dried cranberries. Way back when - before dried cranberries were all the rage - I'd add raisins to my salads. Even a garden salad. That little bit of sweetness with all the veggies is just so yummy. And what's not to like about fresh corn in a salad??!! So many possibilities.